I've never been asked it and I'm sure a lot of you dear readers have never thought of it, but what exactly is a Quark robot? Basically, a Quark robot is a 1960's era refrigerator with a round fish tank head and legs and finished off with a very obnoxious voice. They are also incredibility stupid. When you factor in terrain, also incredibility useless. If you have two broken legs then fear not, you can still outrun a Quark! You've got to love Doctor Who in the '60's. Our logo (which can be seen in the intros before the main menu) has my attempt at drawing a Quark robot. I based it off the wonderful illustration by Joe Callanan over at his Amalgamated Biscuit blog. So, what does this have to do with Lode Runner? Nothing. Absolutely nothing. William Hartnell; curious, grumpy and didn't like people - perhaps the only sane Doctor? These Doctors are hard to rank. Each of these have their strengths and weaknesses. 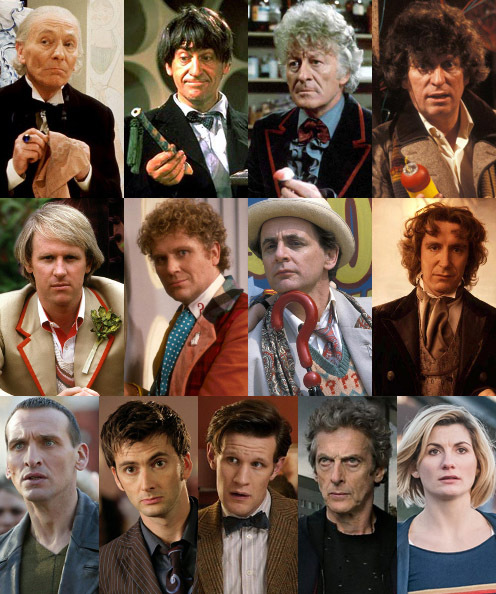 Doctor's 11 and 12 have Steven Moffat to blame for my rankings. Matt Smith; far, far too young to be the Doctor. His storylines were also incredibly childish.